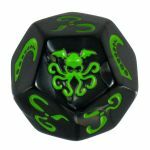 Until I started working on a dice game myself, for which an artist is creating illustrations, I never thought much about dice design. Now I actually think it's a great and possibly under appreciated form of art. This list is meant as an ode to those dice illustrators. 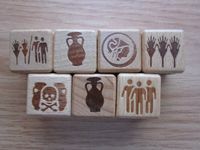 Please add pictures of games with unique dice illustrations, not just novelty dice or regular dice that look nice. This is a tricky one. I normally play Elder Sign on my iPhone and I love how the icons look on it. At the same time, I'm not too much of a fan of how they turned out on the dice. I wonder whether this is due to choices regarding printing/material or whether the original illustrations got a makeover for the iOS version. Simple and clean design. Just my cup of tea. The only thing is that the resident sort of works like the "vase"/"couple kissing" optical thing for me. I first think it's a helmet with a feather on top (being primed by the guard illustration) and then the image flips and I see it's someone's torso and head. Clear and simple illustrations with nicely saturated colors. I'm not too much of a fan of the game, but I enjoy the dice. I've never played this game, but looooove the artwork. Obviously this list needs to have Quarriors in it. There are a lot of illustrations I like and some that work a little less for me. 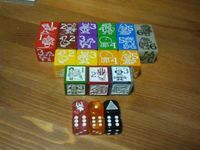 Where the Munchkin dice of protection have art that uses lines that are too thinly drawn for me, I do enjoy the regular Munchkin dice and the Munchkin Jumbo D6. Oh, and I love the glow in the dark ones! The Munchkin Jolly Jumbo doesn't work for me, since the relief on it, makes some of the faces a little less pleasing to the eye for me. I love the dice in Roll Through the Ages. They're big and chunky and I love the burned wood look, and the icons are easy to recognise and are elegant, I think. Dragon dice had it all. Multiple images, custom images for each race and unique die colors (and mixtures) defining the types of magic that could be used. Always loved this game.